M.R.S. 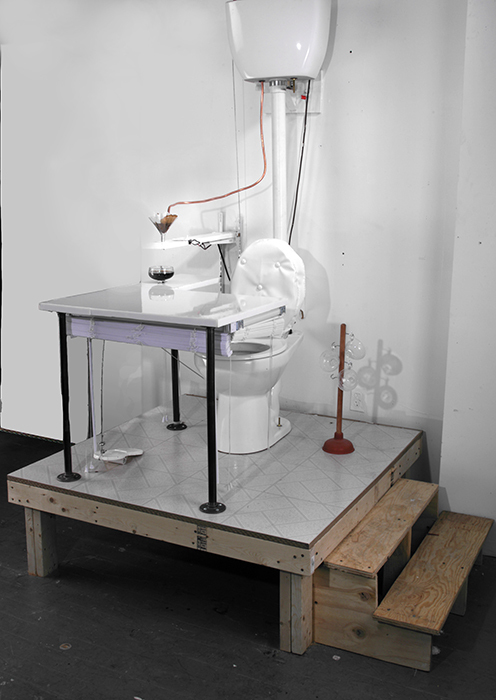 is a toilet that is also a coffee maker and a desk. Each time the toilet is flushed, the incoming freshwater cycles through a coffee maker and heating coil in the tank and delivers a fresh cup to the desk. Venetian blinds can be raised or lowered under the desk to act as a modesty barrier. An endless cycle can be imagined wherein the occupier of the desk uses the toilet, flushes, receives a cup of coffee, drinks the coffee, has to use the toilet again because of the coffee, flushes again, and receives another cup of coffee. M.R.S. is an acronym for Morning Ritual Station but also refers to the abbreviated form of the word Misses, (Mrs.). Kohler is the brand of the toilet, but is also the last name of my grandmother. Although the piece is dealing with efficiency to the point of absurdity, it is also a tribute to my grandmother, Mrs. Kohler, who happens to be a master of multi-tasking.